BMW’s class-leading 3-Series, along with the Mercedes-Benz C-Class and Audi’s A4 and A5, accounted for 1.8% of the overall Canadian new vehicle market in October 2012. Those four vehicles outsold all the vehicles from the second table below, combined. German midsize luxury cars like the Audi A6, Audi A7, BMW 5-Series, and Mercedes-Benz E-Class, and M-B CLS-Class found 722 Canadian buyers last month. That 3.4-to-1 ratio shows the emphasis Canadians place on affordable luxury or at the very least, the means by which we de-emphasize pricier luxury cars. In October, the same U.S. comparison produced a 1.7-to-1 count. 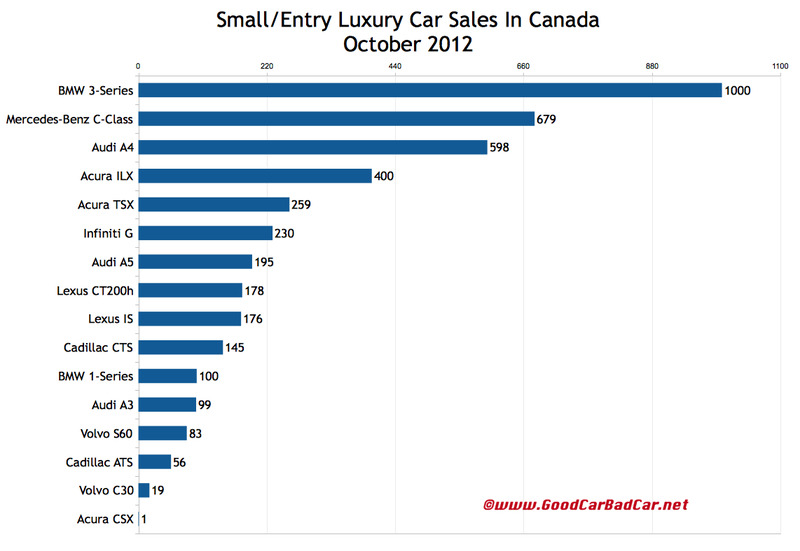 44% of the Acura passenger cars sold in Canada in October 2012 were ILX sedans. Lexus sold three ISF sedans last month. After two straight months with sharp declines, the Lexus CT200h reported a 73% jump. Cadillac sold its first 56 ATS sedans in Canada in October, but CTS sales slid 15% and are down 27% this year. The Lexus ES, which sold more frequently than any other midsize luxury car in October, did so with two models. More than a quarter of all ES sales were hybrids. 209 ES300h sedans have been sold in Canada so far. With 259 October sales, the ES350 outsold the Acura TL in October. And yes, Audi has sold more A7s this year than A6s. 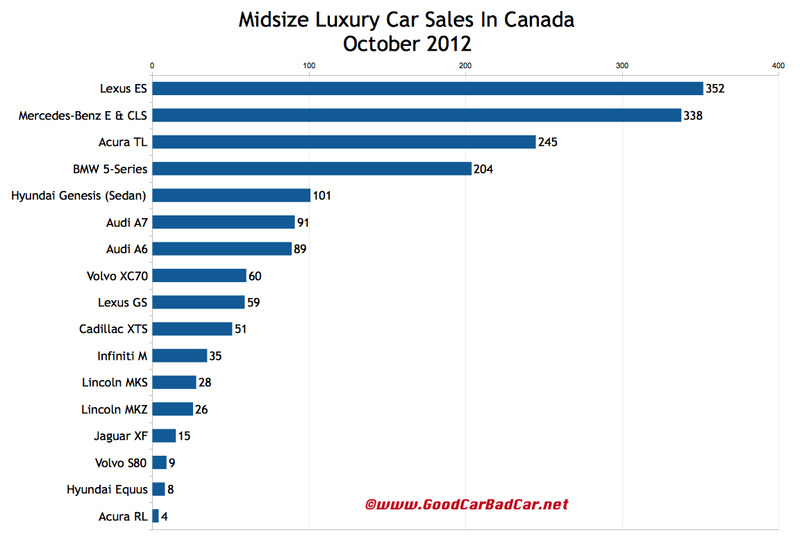 The tables visible after the jump break down Canada’s October 2012 luxury car situation with detailed year-over-year and year-to-date sales figures. Historic brand and corporate totals (monthly and yearly going back to 2004) are now available through the dropdown menu at GCBC’s Sales Stats page, along with results for more than 260 currently sold vehicles. That’s where you’ll find out that Americans are rather more taken with the Lincoln MKS than Canadians. If the vehicle you’re looking for isn’t grouped together with these cars, it may be listed with mainstream brand cars, with luxury SUVs, or in one of the other segments you can access through the eighth dropdown menu on GCBC’s Tally page. Large-size Equus and XTS are here on pricing grounds. Buick, Chrysler, Avalon, Maxima etc. are listed here. Genesis refers to the sedan only.